Hope you had a wonderful weekend! I'm still feeling a bit yucky from this cold I've had and all the meds the Doctor gave me, but I did get a bit of crafting in this weekend. I've got a quick Christmas card to share with you today, then I MUST clear a path in my messy craft corner! * Red mat - Spellbinders die - "Labels 11"
More Peachy Keen stamps on the inside! Ok - I've got about a million things to get accomplished today, so this post is going to be short and sweet! Thanks so much for taking the time to stop by for a visit. I hope you have a wonderful Monday and I'll be seeing you soon! So cute !! I love these stamps I see myself making at least one card a day with them :) hope that bug gets out o your system soon !!! Super cute holiday card. I just saw a challenge that requires pleats...I wish I could remember which site. Be sure to check Feline Playful! How ADORABLE!! 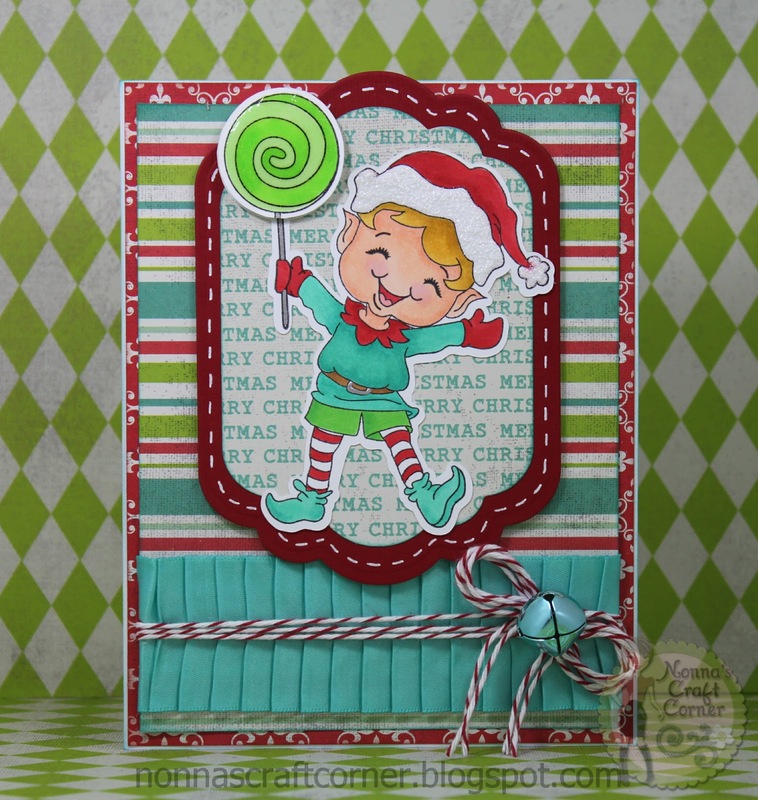 What great paper and that peachy elf is way too cute! I sure hope you start feeling better - being sick is the pits! another adorable card!! LOVE the CUTE PK!!! 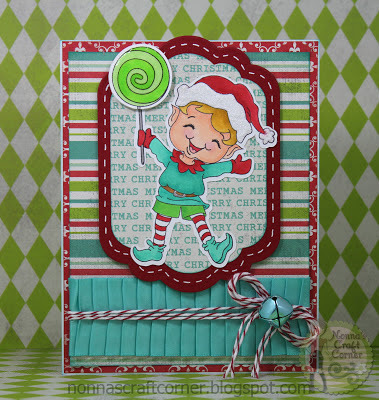 Love the icy blue with other colors and such a cute elf! That is too cute!!! :) I love that adorable elf (great coloring!) and I like the colored bell-it matches perfectly! This is just so CUTE!. The colors are so Lively. Love your card. What a cute card, Tanya! I don't know how you get your creative juices going when you don't feel well, but you did a great job on this card. That image is delightful! That little elf is just too cute and you colored him beautifully. Great card. This is really cute!! I like the decorated inside, too! This is adorable Tanya!Love the cute elf. Love your card. I hope you feel better for you Thanksgiving. Have a happy and a good one. Great papers, stitching and adorable image:) Love this!!! I just got this stamp set, wahoo! Can't wait to create with it.. This is really adorable....love the blue ribbon....did you fold it like that yourself?...it's fabulous...and that adorable blue jingle bell. Super cute card....and I get the busy bee things better than most. Have a wonderful Thanksgiving....and thanks for making such fabulous treats for my eyes all year long. Big hugs. Tanya ~ OMG ~ ADORABLE!!! Simply ADORABLE!! I LVOE that elf and what you did with it!! Colred BEAUTIFULLY! Of course the papers you used ~ INCREDIBLE!!! My that ribbon and that jingle bell is just an AWESOME color too!! I hope you are feeling better! We seem to have caught the cold too! Just the begining ~ YUCK! !